Irene’s Florist is Scotland’s award winning premier florist, the favoured choice of many couples, wedding venues and five start hotels across the country. 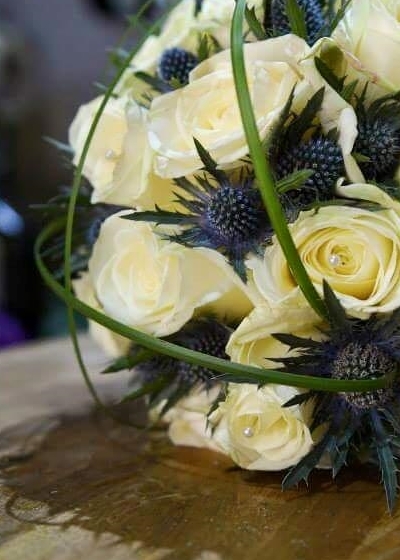 When Irene set up Irene’s Florist in 1978 she had one aim in mind, to provide exquisitely stylish, beautifully presented floral designs to the Scottish Wedding industry, with that in mind her business flourished. Today Irene has a large team of fully trained floral designers who share Irene’s genuine passion and enthusiasm for floral design and excellent customer service. Irene’s floral designers have the experience to deliver premium, bespoke, modern designs which will capture your imagination each and every time. Receiving fresh flowers every day, directly from Holland, ensures only the best quality of results. Specialising in wedding and corporate events Irene and her team pride themselves in providing an outstanding customer experience from start to finish, and provide a no obligation consultation to discuss your visions and what it will cost to make it into a reality. All designs are bespoke and tailored to your exact requirements ensuring you receive exactly what you have in mind. Irene and her team provide an outstanding customer experience across the whole of central Scotland, Fife, Glasgow, Edinburgh and surrounding areas. Not only does Irene’s Florist specialise in weddings and corporate events Irene’s renowned floral designs can be given as gifts and be delivered across Central Scotland. A showcase of Irene’s floral gifts can be viewed and purchased online or you can call or visit either of Irene’s stores. At the delicate time of the passing of a loved one many people like to pay their respects with a floral tribute. Irene and her team take the time to understand what it is you are looking for to provide you with a floral tribute made with care and attention to detail with the freshest of flowers. To enquire more about what Irene and her team has to offer please get in touch. At Irene’s Florist, all our wedding designs are as individual as our couples. Bespoke design is all about personal service and the details, we’re committed to getting these perfect for you. We pride ourselves in creating unique designs that will make your corporate event stand out from the others. We are proud to supply many five start hotels with their arrangements each freshly prepared by our wonderful team. We know that it’s difficult to say farewell to a loved one, that’s why our team take the time needed to understand what it is you are looking for in a floral tribute made with care and attention to detail with the freshest of flowers. Browse our exquisite collection of gifts and floral designs that can be purchased online, freshly made by our team and delivered locally at a time convenient to you. We work together with only the best local businesses to ensure all your needs are met. We know it can be daunting picking the right florist for your wedding, corporate event or a funeral tribute. We are always available to answer any questions you may have so please do not hesitate to get in touch with our team.